This is an improvement that is long overdue. 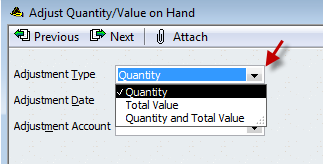 The Adjust Quantity/Value on Hand has been one of the poorest functions in QuickBooks for years, and with this release they have made a dramatic improvement in usability. The most frustrating part of this, to me, was that there was no search capability here. You have to scroll through the list to find an item – and it lists inventory parts first, then inventory assembly items afterwards. Very inconvenient. As you see, no items are listed? 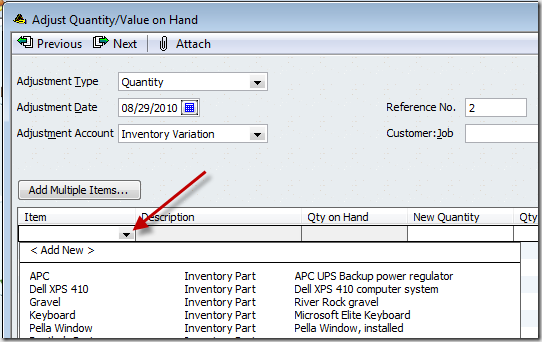 You can add items by using a dropdown list in the item column, just like you would do in an invoice or a purchase order. From this window you can add a new item to the item list, which will help some people. 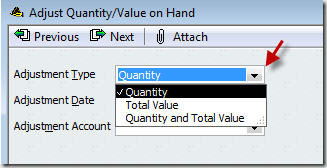 In the initial release, the List Selection feature (such as you have in invoices) doesn’t work. This may be fixed by the time this article is published, hopefully. You should be able to press ctrl-L to open the item list, then ctrl-U to insert the selected item into the transaction. This didn’t work for me (the list opens, but the item isn’t inserted). This feature works for other fields in the window (adjustment account, customer), so I expect this to be fixed soon (if it isn’t already). 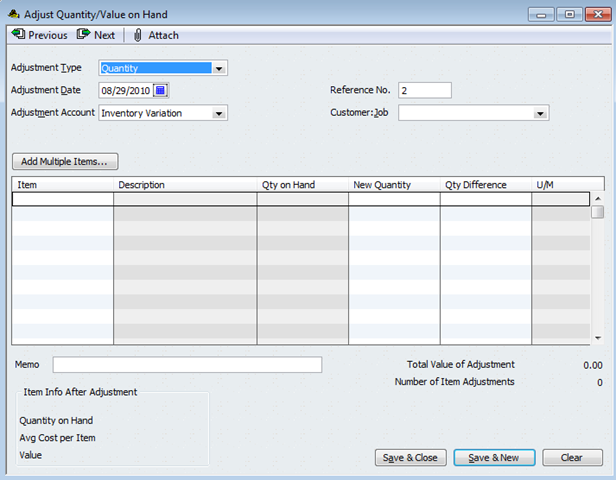 You click a dropdown list to select the type of adjustment. This is an improvement that should have been done long ago. It will be very welcome by anyone who has a large item list and must enter adjustments often. When you click add multiple items, you are still faced with the item list to scroll through and select items. while it might be nice to have them all listed together on one screen after you find them and select them. I find it one more layer of something to do. 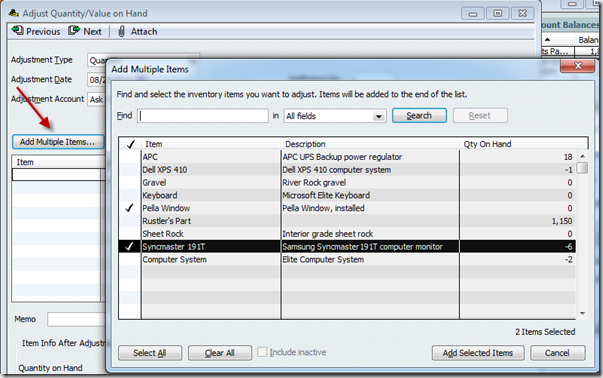 2. click multiple items, scroll down the list clicking on items to be adjusted, click add selected items, then find the item in the new list and make the adjusting entries. What QB has needed to do since I started with QB is when you have the item list open, and you right click on an item and select adjust item, QB should open the adjusting screen with the selected item there so you can do what you told QB you wanted to do, adjust it. 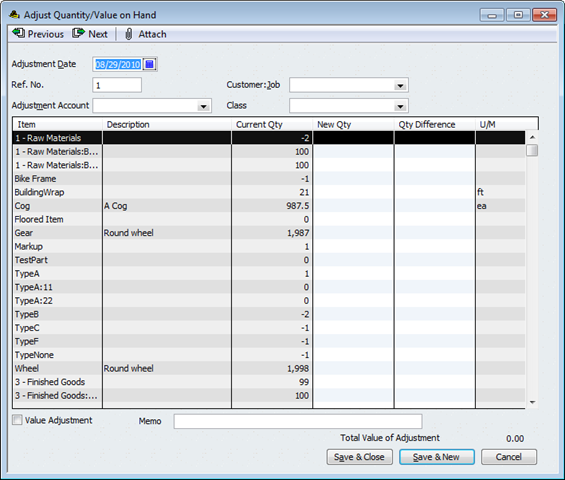 The three choices for types of adjustments are nice and needed, assuming the user knows the impact of the different type of adjustment on the financial data. Since I am not an accountant, can you tell me what is the impact of the different types of adjustments on he financial data. I’m sure my current adjustments have probably messed up the financial data. We have a vending business so sometimes things expire & can’t be sold, sometimes we give samples to customers and prospects, sometimes the inventory just ends up being off for some unknown reason. Thank you for your help. This indeed looks like an improvement. My primary concern would be whether there is a way in the “Add Multiple Items” screen to add ALL items. For instance, can we leave the Find box empty and hit search to return all items? I see the “select all” button, but I’ll need to get the item list into the results box first. 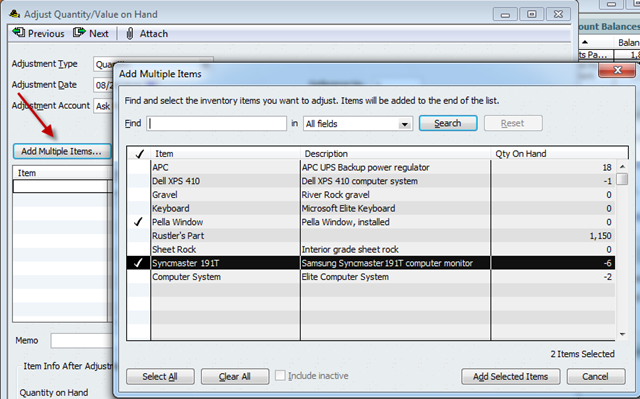 At the end of each year, I do a complete inventory and compare to the “Quantity on Hand” shown in the adjustment screen for the entire list of about 500 items. Makes for a tedious afternoon, but seems to still be the quickest and most accurate way of completing the job. Rustler: Yes, you are right, the “add multiple items” screen still makes you scroll. This new feature is not perfect, there is still a lot of room for improvement, BUT I believe that it is a lot better than they had before. We can hope that they will continue to improve this. 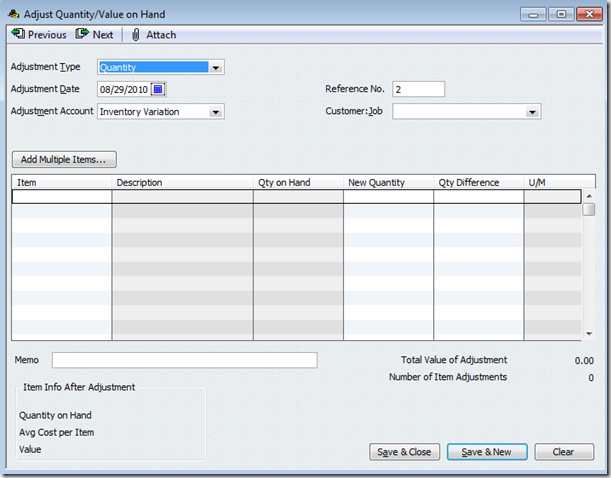 Marjorie: Take a look at my article on adjustments at https://qbblog.ccrsoftware.info/2009/06/quickbooks-inventory-quantity-and-value-adjustments/ as a starting point. Chris: You click “add multiple items” to open that window. Then you click “select all” to select all of the items listed. Then you click “add selected items”. 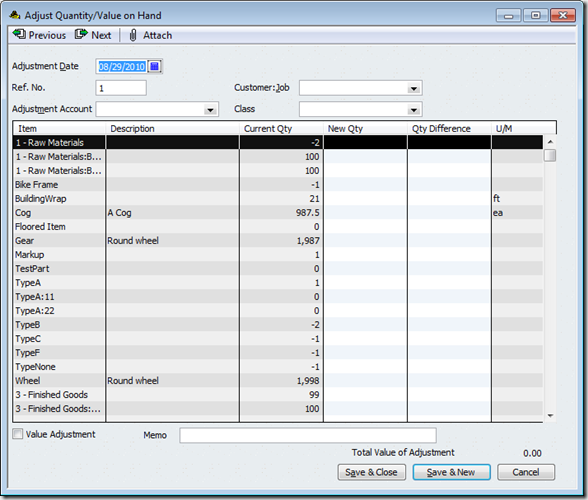 This will put ALL of the inventory items and assemblies into the adjustment window – which leaves you with the same kind of window you had in the older system, essentially. I just wish that we could adjust inventory without having to switch to single user. I wouldn’t care if it prompted for a password from an authorized user but to have to switch to single user just sometimes isn’t convenient. Charlie, do you know if they did anything more with Archiving old records to remove older completed records? This is something I have yet to get to work with Premier Manufacturing version. I have data back to 2004 and I could really just keep these in an archive file for when I need to do comparisons and historical reviews and keep my active file small and fast. Regarding single user – that is why you upgrade to Enterprise. It is a more complicated thing to do adjustments in multi user mode, so they force you to go to the more robust system. Regarding archiving – I’m not aware of any changes there in QB 2011, but Intuit is very poor about telling us ALL the things they changed. The archiving feature in QB generally has poor results – there are other ways to do that, but they cost money. I’m actually doing some research on that – for a future article. Getting better! Now looks like purchase of a newer version can be justified (unlike 2010)! 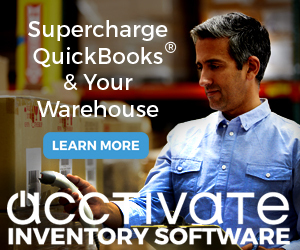 Intuit has stopped selling Warehouse Management. 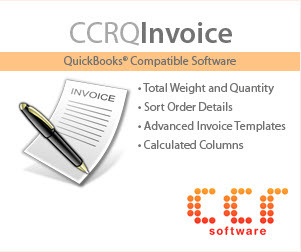 Customers must now purchase directly from Accucode, including all support. Intuit will no longer provide support. Wish this was available in the Canadian version. We use Pending Invoices and Pending Credit Memos to track items going to and coming from jobs. These are then turned into permanent billing items and forwarded to clients at our regular billing cycles. Both are non-posting items. Unfortunately, inventory items do not show up on any reports that we are aware of. 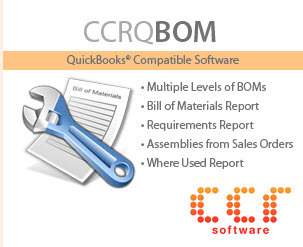 In other words, we are advised by the “Inventory Items by Vendor” report that we need to reorder items—however, they are still on the above pending customer billing and really do not need to be reordered. 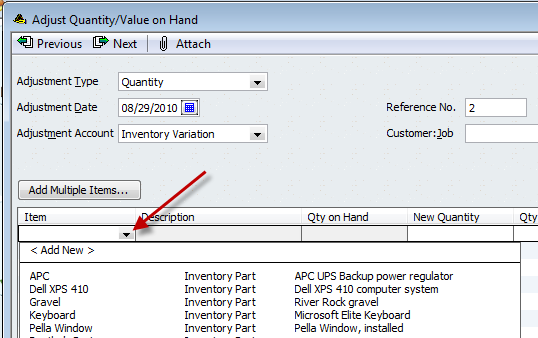 Sales orders are also non-posting and inventory items will show up on the reports, but they will not accept negative quantity amounts to show items that are being returned from a job to stock. Our hope is that pending invoices and credit memos would affect the physical count of inventory items the same as sales orders do. Your comments would be appreciated. Great! I’m glad this has changed. There’s a lot of things in QB that could be upgraded, and this is definitely one of them. This will make things much easier.